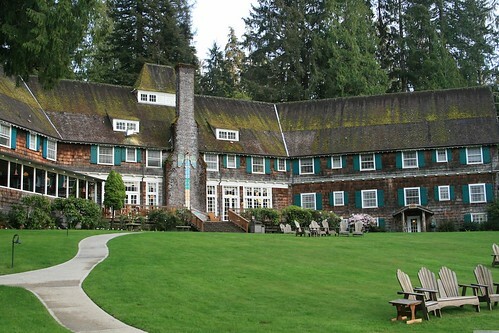 Last weekend, we stayed at the Quinault Lodge in the Olympic National Forest and had a really good time. We had not been on vacation for a while and really enjoyed the much needed break. We visited Port Townsend which is a nice little town and ate at the Silverwater cafe for lunch. The lunch was excellent. Then we found a cupcake place just around the corner from the restaurant that also served gluten free cupcakes. My wife and daughter were craving for dessert and we were pleasantly surprised to find gluten-free cupcake selection at the Perfect Endings cupcake place. Then we had a leisurely stroll around the town window shopping the various types of stores. As we were continuing our journey towards the lodge, we soaked in the sights and sounds of the various locations. 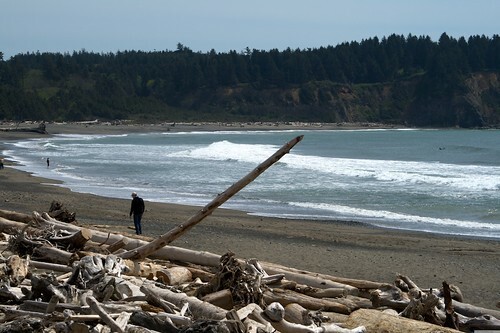 We rolled into La Push beach and it was cold as we got closer to the shore. Having lived in Hawaii and used to swimming, wind surfing, kayaking at the various beaches there, I have a hard time going to the beach all covered up! It was cold and windy but thankfully sunny, though that did not help much. Then we passed through Forks where the movie Twilight was shot. There was not really much to see there though the visitor center had Twilight tour info. I saw a bunch of teenagers were about to go on a Twilight tour. 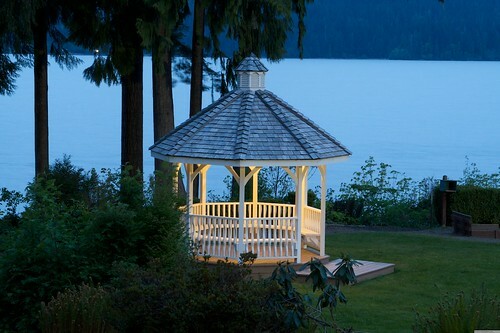 We finally reached the Quinault lodge and I was pleasantly surprised by the location. It was in the middle of nowhere and we throughly enjoyed our stay there. 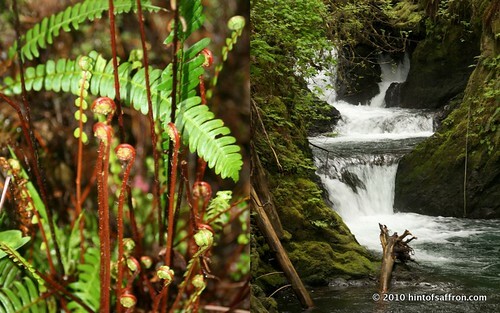 We hiked the Quinault rain forest and it was beautiful with waterfalls and lot of greenery. The lodge itself is a very old and quaint building. It had an excellent restaurant where we ate dinners. The prices were a little on the higher side but thankfully they had excellent food. I was really enjoying myself as food is very important for me and we were lucky to get good food in the middle of nowhere. There was also a small deli oposite the lodge. We ate there a few times for lunch. It was quite decent and had lots of choices. Here are some shots I took waiting for the sun to set and playing with my daughter near the Quinault lake. We went canoeing and it was fun with no one on the lake except us. Nothing like a quiet vacation in the middle of the forest. It really helps to relax you. In spite of eating good food through out the trip, I started missing home cooked meals. So when we got back, I decided to make some traditional Indian food that you do not find in Indian restaurants. It is called Khichdi. 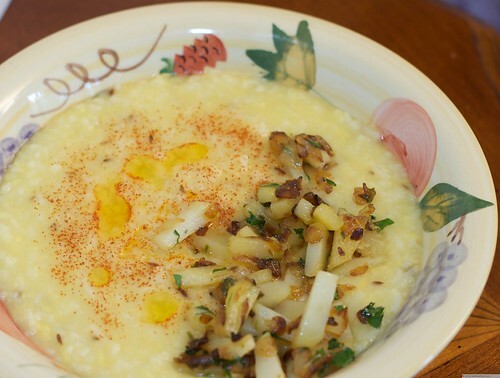 It is made with yellow lentil and rice and usually eaten with spiced potatoes. Since the porridge itself is bland, it is a good idea to eat it with a spicy accompaniment like spiced potatoes or chutneys like garlic chutney. This is a simple but excellent tasting dish. The potato curry goes really well with the porridge. Add some more ghee if you prefer. You can also make this dish with olive oil if you prefer though it might not taste the same. Combine rice and beans in a bowl and wash them in several changes of water. Add 4 cups of water to a sauce pot along with rice and moong dal along with 1/8 teaspoon turmeric and bring to a boil. Reduce the heat to medium and cook partially covered for 30 minutes. Make sure to stir occasionally so it does not stick. Add additional 2 cups of water and salt and continue cooking for additional 20 minutes. Turn of heat and cover to keep warm. In a medium size frying pan over medium heat, add 2 tablespoons of ghee. Add onions and fry till they are lightly browned, approximately 15 minutes. Add chopped green chilies, ginger, 1/4 teaspoon turmeric and potatoes and fry for 5-8 minutes covered or until soft. Take it off the heat and stir in cilantro. Transfer to a bowl. Wipe the frying pan clean with a paper towel and heat 2 tablespoons of ghee over medium to high heat. Once the ghee is hot, add cumin seeds until they turn brown, approximately 10-15 seconds. Add the red chili powder. Pour the entire contents of the pan over the porridge and stir well. Serve with the potato curry and eat!